Works Up To 10x Faster Than Using Your Old Knives! Experience original Stainless Steel Dicer Chopper quality in practical hand format - with this set now 4 Blades. The different blade inserts can be combined with each other - cut thick slices, thin slices, cubes, pins and sixths! Simply insert the cutting material, press down and everything is cut perfectly in seconds. Whether soft or hard foods such as courgettes, tomatoes, mushrooms, eggs, lemons and much more. The extra sharp stainless steel blades are reinforced for fast, even results - every time. With this quick Dicer Chopper, you can cut directly into the pan, bowl or pot: for speed and flexibility without much effort and dirt in the kitchen. Or click the collection container on the handset - for cutting in directly! With the cling-lid you can store any remaining airtight. The Stainless Steel Dicer Chopper is the perfect kitchen aid for quick and healthy meals in no time. Extra-sharp and reinforced stainless steel blades in high quality! Collection container with fresh food lid for direct cutting in and store safely! Kitchen helper for versatility and lightness! Quick Dicer Chopper in format. The smallest of all dicer can be operated with just one hand and thanks to its compact size ideally suited for when travelling. The Stainless Steel Dicer Chopper is the ultimate time-saving device for having fresh-cut fruits and vegetables. Using knives to individually cut fruits and vegetables can take lots of time which can be a deterrent to having fresh cut food. Buying chopped and pre-sliced fruits and vegetables can be expensive. This Dicer Choppers saves money by perfectly cutting fruits and vegetables at home. 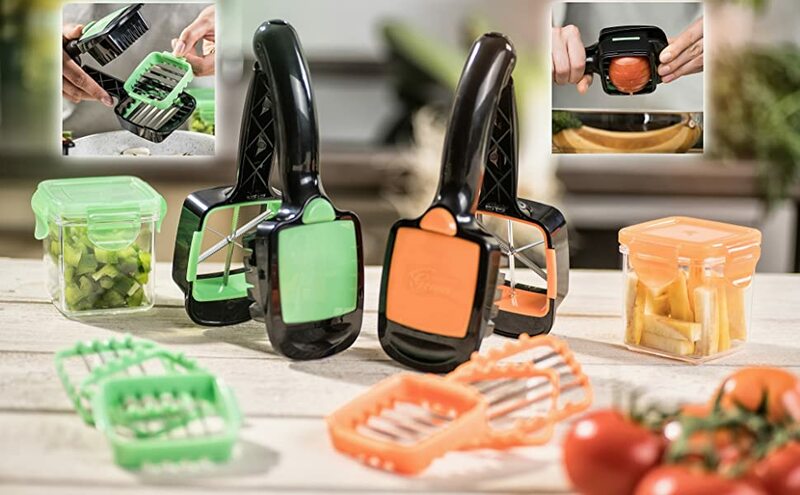 The Stainless Steel Dicer Chopper is a handheld personal at home kitchen tool that cuts, chops and slices fruits and vegetables. It works by attaching the blade insert on the handheld device. Then, place the item to be chopped between the blade and the backing. The user has to clamp the blade over the item and the blade will chop, slice or cut the fruit or vegetable into the selected size. The Stainless Steel Dicer Chopper is intended to be used to cut soft foods only. It should not be used to chop frozen foods or to core foods. This product should not be used to chop bones or other non-edible foods.